This short video will give you an understanding of how Catalyst works and how the various elements work together to help you clean up, document and build your Org. It's on top of your 25 mins, but watch it if you haven't already done so. You are ready to set up Catalyst from Elements.cloud and connect to a Salesforce Org. The video below steps you through installing the managed package and running Quick Start to support this Trail. Install the managed package in a Sandbox or if you don't have one create a Dev Org. the Sandbox you are using was NOT set up by you. When the Sandbox is created all Salesforce username emails have .invlad added to the end (e.g. pete@zenfiner.com.invalid ) for everyone but the person who created the Sandbox. The Elements and Salesforce username structure are slightly different. We wanted to make it easier to manage multiple Spaces and Orgs - from a single user login - so we didn't copy the Salesforce approach. 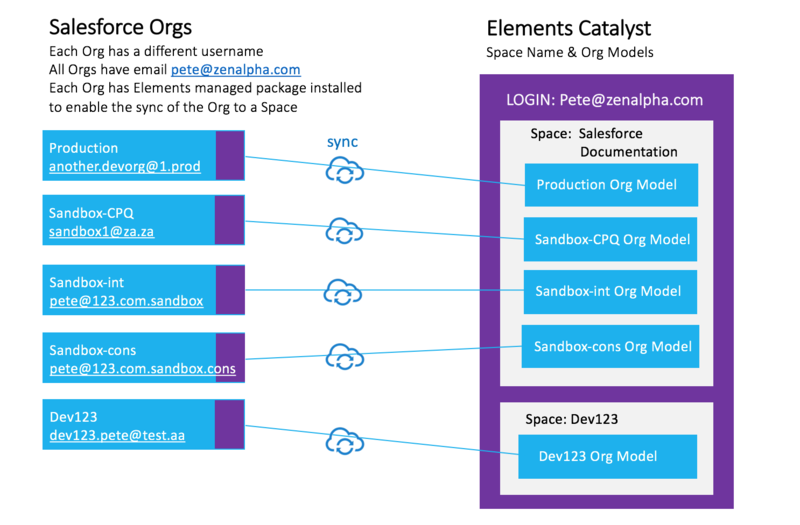 A Space can be connected to multiple Salesforce Orgs (Production & Sandbox). So a Space will have multiple Org Models. So all of the examples below will relate to the "Salesforce Documentation" space you was created in the Quickstart. If you click on "Spaces" in the left blue panel, you can always get back to "Salesforce Documentation" space to see all the information related to this trail. You have sync’d your Org metadata to the Org Model in Elements.cloud. It uses the Tools and Metadata APIs. You can automate the sync to run nightly. The trial only syncs the Salesforce core metadata, but you can also add managed packages to the sync. Now all the metadata is in the Elements.cloud Org Model, the magic can happen. The Org Model may be the first time you’ve seen a perspective of your Org like this. The reaction may be “WOW”, “OMG” or “Ahhh, that’s why…”. How big is your Org? We’ll give you a summary on the right panel. Log into Elements. It runs on the AWS platform, not inside Salesforce. Go to http://Elements.cloud or http://app.Q9elements.com/signin You can login using your Salesforce credentials by clicking on the LOGIN WITH SALESFORCE button. Now you have logged into Elements you need to open the Org Model. Select Salesforce Orgs in left menu. You will see just one listed but there could be multiple Org Models each one sync’d to a different Production or Sandbox Org. Click on the name of the Org Model to open it in a new browser tab. It is a tree structure and you get a summary of your Org in the right panel. Resist the urge to start opening up the tree structure. Instead, click on the “Launch Salesforce Org Analytics” in the top bar to run the report. It gives you some powerful insights into your Org. The report opens up in a new tab in the browser and can be run at any time as it builds the report from the latest Org Model data. Let’s look at that first. Take a quick look at the contents on the left of the report to see what is currently provided. Click on any item in the contents panel to go to that section. The report is interactive. You can filter and sort the graphs. This is more detailed than Salesforce Optimizer and is focused on the configuration of your Org and how well documented it is. The analysis in the Org Model and the Org Analytics report has been designed to help you focus your efforts on clean-up and documentation. It reduces the detective and analysis work for you. Let’s go back to the Org Model in the other tab and start to drill into the Org Model. You can see that it is a tree structure and if you click on the arrow alongside any item (we call them nodes) you can expand it to see the next level of detail (child nodes) and so on down multiple levels. The node has the name of the customization (e.g. the Object name) and in italics the description field is pulled from Salesforce, if a description field exists for that type of customization. Not everything in Salesforce has a description field, such as Apex Classes or Lightning pages. The columns - Tags, Status, GDPR, # of links - can be dragged to change position and size. You can automate the sync to run nightly. If an item in Salesforce is deleted, then the next time the sync runs the Org Model shows the Status as deleted but keeps it in the tree structure along with any documentation you may have linked to it. Whenever you select a node, the right panel gives specific information for that node. In the image below the custom object Project has been selected. Click on the top level of the Org Model (the top row of the tree “Salesforce Production”) and the right panel gives you an overview of all customizations in both the core and managed packages, if you have added managed packages to the sync. The right panel scrolls so you can see more information. If you click on the SYNC HISTORY tab you can see the history of the previous syncs but you can also kick off a new sync from here. For every node in the right panel there are DETAILS, DOCUMENTATION and COMMENTS tab. DETAILS tab has the information that is available through the Salesforce APIs. It varies for each type of node in the Org Model. There is also a link to open up that customization in Salesforce Setup if a setup page exists for it. DOCUMENTATION tab is where you can add documentation. This can be notes, URL links, Data Tables (metadata on metadata), process diagrams and requirements. More on this later. COMMENTS is like a Chatter stream for every node where you can @mention colleagues. BTW the free Viewer licenses allow posting of comments. Open up the Objects section. There will be a Standard Objects section and if you have custom objects then there will be a Custom Objects section. Click on an Object and the right panel gives a summary of the object including the number of records by record type. Just keep scrolling down the right panel. Objects have an additional tab USAGE. This shows which fields (system, standard, custom) have data in them. Remember all those custom fields that were asked for? Now you can see if they were even used. Click on USAGE and then filter the fields by Custom. USAGE shows how populated fields are by record type and also where fields are used. The analysis covers email templates, page layouts, reports, automation and rules. ACCESS tab shows the field access by user for permission sets and profiles. This needs to be requested on demand as it is a huge analysis task. That’s why it is not done for every field in every object every time the sync is run. There is a link in the tab to kick off the analysis and collect the data which is done asynchronously. The USAGE and ACCESS analysis would be impossible to do manually and keep up-to-date. Every item that can be edited in Salesforce Setup will have a link which will open it in the specific page in Setup. It is either “Salesforce Setup” or it is a blue cloud icon. This saves so many clicks, time and frustration. Drill down the tree structure in an Object to a Field. Look at the DETAILS tab and then the USAGE tab. Keep scrolling down the USAGE tab. Open up one of the areas where the Field is used i.e page layout. Click on the icon to launch Salesforce Setup to edit that item. How many clicks and how much time did that save!!! You can include managed packaged into your sync. You add the managed packages from the Elements Space Management Integrations page. Once you have selected the managed packages, you will need to kick off another sync to get the metadata from Salesforce. The metadata for each managed package is in its own tree structure. This is found below the tree structure for the core metadata. The right panel at the top level of each managed package gives the summary data. In the image you can see there are 6 managed packages. 1. Where can you find the total number of objects in your Org? 2. Where can you launch a sync from?